ON THE face of it, democracy in India has won a small battle. People's aspirations have been met by the creation of the three new states - Chattisgarh, Uttaranchal and Jharkhand. The people agitated for decades against apathy and skewed development of the mother states - Madhya Pradesh (MP), Uttar Pradesh (UP) and Bihar, respectively. But statehood means only half the battle won. As Chandi Prasad Bhatt, leader of Chipko Andolan, once said, "when you break a stone, all you get is more stones," the unholy nexus between politicians, bureaucrats and business interests, a legacy of the earlier states, is still to be contended with. All three states are blessed with great natural wealth, which the previous callous governance had exploited to the hilt. This resplendence is their only ally. Be it forests, minerals or the river systems, they have to use the natural resources for generating revenue. But the catchword is 'judiciously' - a tightrope walk that not many have been able to do even with limited success in India. Here lies an opportunity to abandon the older development model and adopt a new strategy. The new leaders have begun with promises galore. For Uttaranchal chief minister Nityanand Swami, "my priority is building roads" to reach the most inaccessible areas (almost always through deep forests). For Babulal Marandi, his counterpart in Jharkhand, it is ensuring law and order in his state, many parts of which are virtually controlled by half a dozen ultra Leftist groups. And for Ajit Jogi, the chief minister of Chattisgarh, it is to tackle the drought, which has severely affected 45 out of the 90 tehsils in his state. The people of the three states have never asked for much. The struggle for statehood was strung around the battle for rights over "jal, jungle, jamin" (water, forests and land) - the axis around which their life revolves. The new states have to deliver on these three issues. But the signs are ominous. Just before the birth of the states, ugly political scenes and horse-trading marred the occasion. In Chattisgarh, bitter political fights led to heckling of the MP chief minister, Digvijay Singh. In Uttaranchal, it was an open fight over the chief minister's chair. And in Jharkhand, members of the legislative assembly (MLAs) were put under house arrest. Here, too, there were closed-door meetings till the very end over the decision to name the state's chief executive officer. On the day, the state was born, president of the Jharkhand Mukti Morcha Sibu Soren called a bandh to make his desire to take the CM's post known. Interestingly, in an interview with Down To Earth in 1992, he had said: "When Jharkhand comes, I do not want any position but will continue to work for the people. I will not make politics make a street dog out of me." Indeed, public memory is short and politicians surely know when to say what. After separation, the parent states have been literally left with nothing. Bihar, already a failed state, is likely to slip further. After losing its industrial heartland, which is compared to the mineral-rich Ruhr region of Germany, all that Bihar is left with is the fertile, but flood-prone Gangetic plains. Uttar Pradesh has been left with less than 5 per cent forest cover now. Development for the three states is essentially to be based on the natural resources they have. The forest cover in the three states is better than that in many other states. Uttaranchal has a forest cover of 43 per cent, Chattisgarh has 42 whereas Jharkhand has 25 per cent of the states' land area (see graph: Little cover). Ministers and politicians harp about using forests to generate revenue. In the rhetoric, the real picture is lost. The cover may be greater than that in other states, but it is nebulously surviving in two states and getting depleted in the other. According to the Forest Survey of India's State of Forest Report, in an assessment published in 1999, Jharkhand had 2.2 million ha. In the 1997 report, it had 2.6 million ha. This implies a loss of 4,800 ha of forest cover, of which 1,400 ha was dense forests. In the case of Uttaranchal and Chattisgarh, though statistics show an overall gain in forest cover, the loss of dense forests has not stopped. Chattisgarh lost 30,300 ha of dense forests, while gaining 56,100 ha of open forests. Utaranchal lost 5,100 ha of dense forests and gained 6,800 ha of open forests (see graph: Open and shut case and Balding patches). Being hill areas, under the forest policy of 1988, Uttaranchal and Chattisgarh should strive to bring two-third of the geographical area under forest cover. For Jharkhand, it should be one-third of the geographical area. The challenge is to achieve the required minimum through afforestation and regeneration activities and to make up the shortfall (for Uttaranchal 23 per cent and for Chattisgarh 24 per cent). Jharkhand faces the toughest challenge of not only making up the shortfall, but also curbing further deforestation. All this calls for proper leadership and a suitable management strategy. In Bihar, the government adopted joint forest management (JFM) way back in 1990, but it still languishes with an average 17 JFM community organisations being formed every year. The reason being the benefit-sharing ratio: communities get a mere 33 per cent of the usufructs. The state forest department's budgetary allocation for afforestation is even more dismal: a mere five per cent. Besides unplanned afforestation has resulted in the alienation of the community that takes care of the programme. To turn low productive forests into 'money' trees, in the late 1970s, the Bihar's State Forest Development Corporation started large-scale exploitation of sal (Shorea robusta) and replaced it with teak (Tectona grandis) plantations. In Uttaranchal, it is monoculture species like pine (Pinus roxburghii) that is replacing broad-leaf tree species such as oak (Quercus sp). 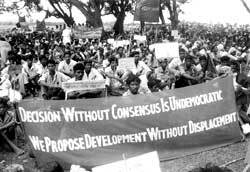 People dependent on sal products protested and uprooted the planted trees in 1978. The Bihar government ultimately stopped the programme. Now it wants to spread JFM for both afforestation and reforestation, but there are no takers. In the case of Uttaranchal, officials portray a vigorous programme of van panchayats saving the forests hand-in-hand with the forest department. By 1993, the hill districts of Uttaranchal had 4,804 van panchayats covering more than 300,000 ha of land. JFM programmes, in one garb or the other, have been promoted in the region since 1930s. But ground reality is contrasting. Today, the revenue is divided in a 50:50 ratio - not substantial enough for the communities to take up regeneration and conservation. Despite funding from the World Bank, JFM has become a farce. For Chattisgarh, as it inherits MP government's community-based watershed development and JFM programmes, the institutions are already there but whether they would enjoy the same political patronage as under Digvijay Singh is still debated. Jogi says that the Rajiv Gandhi Missions that implements these programmes would continue but with a 'Chattisgarh stamp'. However, he fails to explain what the 'Chattisgarh stamp' would look like. Distribution of minor forest produce (MFP) is another crucial issue. The local people do not have absolute rights over MFP, though it is crucial for their food security. The state trade in them to earn revenue. 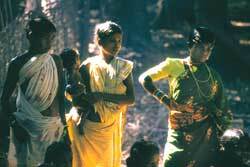 Traditionally, the tribal people depend on forests for six months and another six months on agriculture. But for states like Chattisgarh and Jharkhand, which have negligible areas under irrigation and depend solely on monsoon for agriculture, MFP could help in maintaining the food cycle. Now with deforestation and soil degradation, the food cycle has broken and this has led to large-scale migration in Chattisgarh and Jharkhand. A survey of 100 villages done by the Ranchi-based Gramin Vikash Trust in Jharkhand shows that if the local community is given access to the MFP, migration could come down substantially. The reality is that local people living in the forest-rich areas have traditionally protected them. This, till the government took over. One of the reasons for the strong presence of the ultra Leftist groups or Naxalites, extremist outfits who claim to be fighting for the people's traditional rights, is communities' alienation from land and forests. Chattisgarh is under the shadow of gun-totting Naxalites. So far, only six of the Chattisgarh's districts have been declared "Naxalite-affected" by the government. But the movement is present in at least a dozen districts. One of the reasons for their presence, say many experts is the faulty Forest Conservation Act (FCA), 1980, which curtails people's access to the forests. "Abolish the forest department and hand over the forests to the people," demands Soren. The new leadership recognises the importance of giving back the forests to the community, but their commitment is not strong. Marandi said resource management is his priority, but within a fortnight widespread industrialisation found more favour. When asked about the conflict that may arise out of mining in forest areas, one MLA in Uttaranchal, says, "We will mine mineral-rich areas in the forest land by digging tunnels. No harm will come to the environment." Jogi does not want tribal people to be mere "showpieces" but for that development like mining cannot be stopped. In other words, mining is important for development to reach the tribal people. He is obviously unaware of the fact that it is not mining, but ecological restoration alone that can help them. In any case, mining has never done wonders for the local people. Take Jharkhand, for instance. Mines employ a mere five per cent of the local population, while displacing 30 per cent of them, besides eating away their forests. In an interview to Down To Earth, Jogi talked about allowing only Indian companies to mine. In the debate between the Indian and foreign companies, the local people are completely forgotten. In any case, are Indian mining companies any different from foreign ones? The end result has always been depletion of resources and marginalisation of the local people. Water is another resource that is a problem amid plenty in all the three states. Consider the fact that all the three states receive annual rainfall of 1,326 mm (Jharkhand), 1,667 mm (Uttaranchal) and 1,338 mm (Chattisgarh). Each state gets more that what Punjab or Haryana get. Yet, irrigated land is less than 56 per cent in the case of Uttaranchal, a disappointing 16.6 per cent in Chattisgarh and a shameful seven per cent in Jharkhand. In Jharkhand, according to the state agriculture department's statistics, 90 per cent of the rain falls during July and September, 80 per cent of which is lost in runoff. The high runoff also causes soil erosion. So the result is that 50 per cent of the agricultural land of the state is unproductive and almost all farmers sow only one crop. In Chattisgarh, according to an inter-department document, 1.136 million ha of land, most of it belonging to marginal farmers, have been severely hit by the drought. In Uttaranchal, despite its enormous water resources, 3,729 villages do not have potable water supply. It is also besieged with the question of control over its waters. Few days before statehood, it lost its revenue rights over sanctioned hydel power projects to Uttar Pradesh. Ironically, all these states have the right topography for extensive watershed activities and huge potential for water harvesting. But hardly any initiative is being taken in this direction. Like their predecessors, will the new leadership make every effort to use natural resources to generate more revenue, degrading the environment further? Or will they use them sustainably? Development plans will have to promote natural resource-based enterprises in a way that poor communities benefit the most. This will call for innovative thinking and institution building from the bottom up. But it is the state leadership, from top to bottom, which will have to show intelligence and ingenuity in dealing with the development challenge faced by these new states. The distressing thing is that no development blueprints are ready yet, nor is there any evidence of a changed mindset of the leaders. "One has to understand that the state was born only on November 1. We couldn't formulate any action plan before that," says Jogi. Plans given voice by the new governments sound just as hollow as those of the previous regimes. What has to be understood is that the days of excuses or tall claims are now over. The new leadership has to find answers to the apprehensions put forward by the birth of the new states. How will the new states be managed? Will the natural resources continue to get plundered? Will the people ever get a change to participate in their own development? It is time the people get their due. This one time, the governments need to do more than play their usual games. 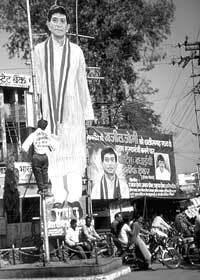 WHILE the first chief minister of Uttaranchal was being sworn in at midnight on November 9, 2000, many leaders who fought for statehood swore to continue the struggle. "It is not over yet," summed up Kamla Pant, a leader at the forefront of the movement and member of the Uttrakhand Mahila Manch. "It is a state born bereft of rights over its own resources," she added. Uttaranchal was born after one of the longest, but peaceful, movements for statehood. All this despite state repression. As in the case of Chattisgarh and Jharkhand, the root cause was people's receding rights over their natural resources. "People watched the ruthless exploitation of their resources - forests, water and land - by the government and rose in unison to claim what was rightfully theirs," says Anil Joshi of the Himalayan Environmental Studies and Conservation, a Dehradun-based NGO. But considering the natural wealth of the state, it is anomalous that more than 70 per cent of the state's seven million people live close to or below the poverty line. Uttaranchal has a forest cover of 2.3 million ha, which is 43 per cent of the total geographical area. It is also endowed with the Ganga whose watershed spreads across 105 million ha. "For years, people managed their resources sustainably. But successive governments looked upon the forests as only a source of revenue. They took away the people's rights. The Chipko movement, led by the women of the region, was a backlash to this process of alienation," says Avdhash Kaushal, director of the Rural Litigation and Entitlement Kendra, another NGO based in Dehradun. Unfortunately, the process of alienation has not halted with attainment of statehood. Sunder Singh Panwar, a resident of village Hatnali in Uttarkashi, looks at the river Bhagirathi flowing along the road he walks and exclaims in anguish, "How can people in Delhi and UP decide what is to be done with the waters of Bhagirathi?" The incredulity is visible on his face. He has just been told of the new dispensation under which the Ganga Water Board will manage the river and its tributaries - a ploy to steal Uttaranchal's real wealth, agree many ministers in the new cabinet. Under the Uttar Pradesh Reorganisation Bill, 2000, the board will manage projects regarding "irrigation, rural and urban water supply, hydropower generation, navigation and industries". A resident of the state cannot set up even a small micro-hydel plant without prior permission from the board. Bachan Singh Panwar, Sundar's father, is disappointed. He owns a gharat (water mill) that he wanted to use to generate power for his entire village. "The nearby villages have electricity. I have often dreamt of bringing electricity to my village. But it's the same bureaucracy at work again," he says. According to Anil Joshi, Uttaranchal has 70,000 gharats, each capable of generating five kilowatt (KW) of energy. "If the state is able to integrate them on to the grid, it will not have to depend on large dams to meet the power demands." Currently, the watermills are suffering from neglect. Many have closed down. State of art technology is needed to salvage them. Water resources must belong to the people, says Joshi. "Otherwise what is the justification for creating a new state?" he questions. But Uttaranchal seems to have lost control over its resources even before its formation. When quizzed about the issue, Harbans Kapoor, a senior member of the Legislative Assembly, says, "I do not know of gharats." Nirupumma Gaur, state minister for urban development, is no less ignorant, while chief minister Nityanand Swami of the BJP said the matter would be reviewed soon. 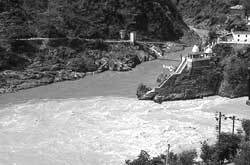 Just before the creation of the new state, the UP government signed a deal for setting up as many as 33 hydel power projects. "Uttaranchal will not earn from the projects already under construction. It will get only a small percentage of the electricity produced," says an exasperated Kamla Pant. According to Manohar Kant Dhyani, a senior BJP leader, projects in Tehri, Vishnuprayag and Srinagar were sold to private contractors. Enron is the main contractor for the Srinagar project. Media reports point to the 80 ha of fertile land that was given away for pittance for the project. Dhyani is aware of the perils of continuing with the arrangement. "The people of Uttaranchal will not accept this," he says. But Munna Singh Chauhan, a senior politician from the tribal Jaunsar region, says, "Why did the BJP MLAs not protest at the time of passing the bill? It shows their lack of vision. We gave away our rights on a platter. Clause 79 and 80 of the bill (relating to the board's powers) negate the sacrifices made by those who fought for statehood." Babu Ram of village Lakhamandal in district Chakrata, which is Chauhan's constituency, says, "Every household pays a bribe of Rs 20 per month to the local official at the electricity department to draw power, though it gets switched off between six and eight in the evening. What is stopping the government from providing us the basic requisites - water, electricity, road connectivity and rights to forests?" He doesn't know his political representatives have bartered his rights. But he is among the fortunate ones. He has a perennial water spring in his village and a municipal supply line. More than 3,500 villages in the 13 districts of the state do not have drinking water. Saroj Onial, a retired professor and an active participant in the Uttrakhand movement, the traditional name of the Garhwal-Kumaon region, was among those who lit lamps to celebrate statehood, albeit with a heavy heart. "Our new government has not shed the character of UP's political culture. They squabble over offices and portfolios. They fail to realise the burning issues of jal, jungle and jamin (water, forests and land)," she says. Dhyani believes migration is the issue. But experts such as B K Joshi, executive director of Centre for Himalayan Development and Policy Studies, a Dehradun-based NGO, says, politicians need to realise that these issues are all interrelated. "You cannot work on solving them in isolation," he says. Kamala Pant sheds some light on the issue. "Half the region's sown area is not irrigated and productivity is low. More than 65 per cent of the landholdings continue to be of less than one ha, that too often scattered over the landscape, rendering agriculture arduous," she says. At the same time, people have no rights over the forests. The state needs to denotify the reserve forest area so that the people can have alternative source of income from the forest produce, she says. But there are allegations, even from officials in the chief minister's office, that the government is driven by an agenda written by contractors. They say, many of the ministers are known forest or building contractors, others have strong links with the liquor mafia. "How can you expect the murderer to protect the victim?" they ask. "It is not we politicians but the women and men like Chandi Prasad Bhatt, who have kept the natural resources intact we so proudly proclaim as 'potential source of revenue'. But the new government has forgotten them," says Chauhan. The forest cover is fast dwindling and continuously under pressure from timber smugglers under political patronage and a corrupt forest department, says Kaushal. If the forests are being protected, it is not because of forest officials. "We can do without some of the 54 Indian Forest Service (IFS) officers in Uttaranchal," says Matwar Singh Kandari, a minister in the new cabinet. Earlier, the forest officers were 'portioned' off to manage, for instance, 100 ha of forests. After statehood, they were divided according to the percentage of forest cover in the two states because of which Uttaranchal has got the lion's share of the cadre. Now there are nearly twice the number of officers to manage each 100 ha of forest land, says Kaushal. A senior bureaucrat observes, "The Indian Administrative Service officers did not wish to join the new Uttaranchal cadre, but IFS officers lined up to apply. They are lured by the money that can be made from the forests here," says Kaushal. The World Bank-funded joint forest management programme, in the meanwhile, claim experts and foresters alike, has been an eyewash. It has eroded the traditional systems of managing forests, without giving any benefits to the people. An IFS officer, wishing to remain anonymous, says the revenue sharing structure has made the programme a failure. It also allows the forest department to say that people cannot manage their forests. Ironically, Mohan Singh Rawat Gaonwasi, minister in the new government, narrated at a public forum the story of a group of women in the Makkumath village in Chamoli district protecting their forests by guarding it 24 hours a day. At the same forum, Meema Devi of village Jakholi in Uttarkashi demanded traditional rights over the forests in her gram panchayat. The chief minister, who was present at the gathering, promised her. But in the interview to Down To Earth, he shied away from asking for an amendment to the FCA, while talking about handing the forests back to the people. He is obviously unaware of the fact that any amendment, if necessary, will have to be carried out by the Centre (see interview: I want to hand over the forests to the people). FCA and other proclamations of the Union government are going to upset the apple cart for Uttaranchal. Trade in herbs alone has a potential of at least Rs 150 crore annually, says Vijay Prasad Bhatt, a scientist at the Herbal Research and Development Institute at Gopeshwar in Chamoli. The ministers acknowledge that it is a big revenue earner but none of his ilk mention that the true bearers of knowledge of these herbs, communities like the Bhotias, for instance, should directly benefit from their expertise. Bhatt says, "These people have been forced into illegally selling herbs to large companies. If the government had utilised their expertise legitimately why would they have become smugglers and thieves?" Bhatt says there is no check on which herbs are uprooted and sold off. Swami is sure that the biodiversity and herb variety will enable the state to be one of the largest exporters of herbs in the country. But to do so detailed research is needed. "Let us not be rhetorical," quips Bhatt. Ministers and MLAs talk of acting fast to save herbs from being exploited by outsiders at the cost of the local economy. But no logistics or plans are forthcoming yet. Hemvati Nadan Mamgain, representative of Dhad, a Dehradun-based NGO, says, "Our future is determined by our geographical limitations and our natural endowments. I hope this new polity can understand the nebulous link between natural resources and development better." Adds Chauhan, "All we politicians have to do is listen to the wisdom of our hill women and be guided by the actions of men like Chandi Prasad Bhatt." ON NOVEMBER 15, 2000 when the collective dream of some 22 million people for half-a-century rolled into reality, there was hardly anybody to celebrate. Jharkhand, India's youngest state and one of the richest, was born at midnight. Twenty minutes later, a new government was sworn in to chart out its destiny - a century after the legendary Birsa Munda's call for self-governance. Few kilometres away from Ranchi, the capital, in the tribal village Gari, lay the challenges to and solutions for Jharkhand's future. For survival, the 250-odd residents depend on the fast receding forests and the one crop they harvest during monsoon. "A new state or an old one, we have to survive on them," says Mangra Munda, a resident. On second thoughts, he adds, "But if we get more water, we will harvest more." Munda knows the route to prosperity, but he is helpless. The village does not have a panchayat, because Bihar has not held panchayat elections for two decades even though it was one of the first states of India to adopt the Panchayati Raj system. Except the postman, who is also a village resident, no government officials go to Gari. "Life is tough but we don't have anybody to approach," says Mangra. So when the village's only link with the outer world, the transistor radio, announced the birth of Jharkhand there was little merriment, but much hope. Amid expectations are the new challenges for the leaders. To address the region's pressing problems, a new development strategy is needed. The state does not have panchayats. The strong presence of ultra Leftist groups cannot be ignored. Forest cover is dwindling. "But the government has to perform as it has to fight elections in two years," says Ajaya Verma, a senior journalist based in Ranchi. "Jharkhand is a distinct socioeconomic enclave. It needs a suitable development strategy," says Saryu Roy, convenor of the ruling National Democratic Alliance. The Jharkhand movement thrived on the issue of natural resources management and distribution, and more importantly 'governance by the people'. It revolved around water, forests and land. Unfortunately, despite the riches and the struggle for statehood (longest among the three new states), no political party has a development blueprint ready for the new state. But one thing is for sure: everybody believes it is vital to take a U-turn in its development path - from the mines and industries-based economy to a natural resources-based sustainable one. Mining is eating the forests. "The mineral wealth will be depleted one day, but along with that the forests will also disappear," warns Sahadev Jha, chief conservator of forest. Mines and other industries are in any case considered useless by the local people as they employ hardly five per cent of the workforce, while displacing around 30 per cent of the state's population. "Forest, land and water are the focus," assures Babulal Marandi, the chief minister (see interview: If necessary we can change the Forest Conservation Act). Ram Dayal Munda, former vice-chancellor of Ranchi University and a social activist, says, "Agriculture was ignored, while all the attention was given to mining and industries. Forest was also taken away from the tribal people as it contributed seven per cent revenue to the state's coffer." One of the reasons cited for the strong ultra Leftist presence in many districts is that most of the fertile land is owned by non-tribal people. In the 1950s, under the Five Year Plans, large areas of fertile and forest lands were used for industrial purposes. Millions of hectares of forest land were taken over by the government under the Indian Forest Acts of 1878 and 1927, and the Bihar Private Forest Act, 1927, converting community forests into a source of revenue. According to the State of Forest Report 1999 of the Forest Survey of India, Jharkhand has 2.2 million ha of land under forests, which accounts for 25 per cent of the total land area. Of this, 1.105 million ha is dense forests and 1.059 is open forests. Going by the State of Forest Report 1997, Jharkhand lost 1400 ha of dense forests and 34 ha of forests between 1997 and 1999. The loss in quality of forests is attributed mainly to the leasing out of forest land to contractors associated with timber trade. This was stopped in 1981 but, according to forest officials, the mafia stepped in the illegal timber trade backed by politicians. It is an acknowledged fact that Naxals were called by villagers dependent on forests to get rid of the mafia. "The Naxal threat has definitely saved many forest," admits Jha. The three major Naxal groups active in this region have issued a ban on felling. The Bihar government adopted the joint forest management (JFM) in 1990. Hence, Village Forest Protection and Management Committees (VFPMC) have been formed in many areas. Out of the 1,675 VFMPCs constituted in Bihar, 1,402 are in Jharkhand. "Under the present arrangement, after the villagers form the VFPMC, the forest department usually takes three to five years before formally entering them into the JFM programme. Due to this, the rate of spread of the programme is very slow," says I B Singh. Under the present sharing arrangement, the villagers get free fodder and fuelwood but there is a resource crunch. "We have not been able to pay the villagers. Due to this our credibility is at stake and the Naxals are targeting us," admits a forest official. "Jharkhand is malnourished," says A K Sarkar, dean (forestry), Birsa Agricultural University (BAU) - 40 per cent of the land in the uplands is already unfit for agriculture, the remaining 60 per cent in the medium and lowlands are getting silted and losing productivity. According I B Singh of Gramin Vikash Trust, 50 per cent of farmers earn for three to five months a year, 20 per cent for nine to 12 months and only 10 per cent earn surplus. "The number of BLAD (between life and death, the people who don't have any source of livelihood) people is increasing," he says. What makes the situation worse is the lack of irrigation facilities despite heavy rainfall. Only seven per cent of the land is irrigated. The state produces 2.10 million tonnes of foodgrains, while the demand touches 4.36 million tonnes. Already two million people are reluctant nomads or 'eco-migrants'. To start with, the state needs to evolve its own development model, one that is not dependent on mining and industries. The sheer pressure of the Jharkhand movement has forced political parties to talk about natural resources. In fact, the first cabinet meeting of the state deliberated on a move to scrap all forest-related cases pending against tribal populations in an attempt to bring them closer to forest conservation. Besides, says Sudesh Mahato, a cabinet minister and convenor of the All Jharkhand Students Union (AJSU), "Panchayat institutions have to be revived so that we get a semblance of governance at the roots." The government has decided to hold elections in February. This will be the first step towards devolution of power to people," says Munda. Politicians cutting across political lines agree that the problem of Naxalites can be controlled only through community management of resources. It was also echoed in a Union home ministry meeting of Naxal-affected states early 1999. With the formation of the new state, various social groups representing different tribal communities have demanded that the forest be handed over to them. Going further, the Jharkhand Mukti Morcha (JMM) issued a statement threatening all corrupt forest officials and opposing the appointment of a former Indian Administrative Service officer as governor. But the biggest hurdle seems to be the Forest Conservation Act, feel politicians and social activists, that curtails people's access to the forest. Roy feels that the FCA has failed to conserve the forests. "It has made almost all tribal people criminals in a legal sense. Let Jharkhand make the start by going for pro-people amendments," says Roy. What you need is basically a political will to transfer power to the people, feels K J Anthony of Jharkhandi Organisations of Human Rights (JOHR). The forest department, which hasn't been able to cope with the degrading forests, has also come out with a document seeking transfer of MFP to the people. "Being a representative of the tribal community, I will make sure that people get the FCA suitably amended," vows Mahato. The same political will is also called for in water conservation efforts without which the 'change of development axis' doesn't seem possible. Though the government has spent Rs 140 crore in the last two decades on soil and conservation measures, it has not shown any results. However, a review of 100 villages done by I B Singh shows that availability of water has restored food security and has also contributed towards mobilising communities for other programmes. "With traditional water harvesting, the state's 50 per cent lands can be irrigated," he says. The chief minister has also acknowledged it. It is a politically sensitive decision of Marandi as the state saw a massive protest against big dams and some of his cabinet ministers spearheaded the movement. Says Mahato, "Jharkhand's topography is suitable for small structures". Referring to a local need-based water conservation policy, R P Roy Sharma, vice-chairperson of BAU, says: "Let the panchayats and users' cooperatives be at the helms of affairs. It would make water conservation a big mass movement and also help people fight the problem of water scarcity." Back to Gari and Mangra Munda. The transistor radio must have aired the new government's agenda and his expectations must have undeniably soared.